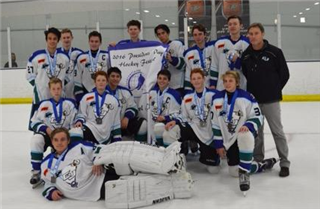 Congratulations to the Carlsbad United Boys Hockey Team on an impressive inaugural season. The team finished the season with a 10-3-1 league record, an overall record of 22-6-2, a championship win during a Presidents Day Tournament in Orange County, and a postseason run to the semifinals. Pacific Ridge team members Aden Dinning '18 and Derek McInerney '18 played a large role in the team's offensive success. According to Head Coach Todd Cadieux, the hockey program will field a JV, Varsity, and feeder team next year.